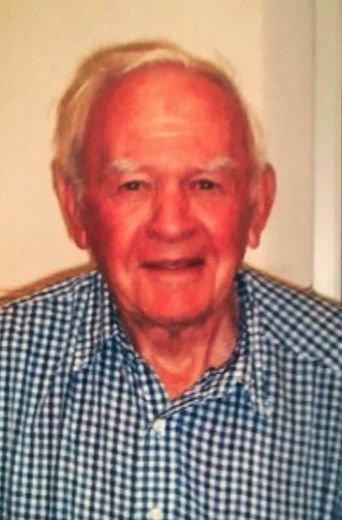 Donald L. Magnuson, 87, of Willmar, died Tuesday, April 2, 2019, at Bethesda Grand in Willmar. His funeral will be 11:00 am, Friday, April 5th at Willmar Assembly of God. Burial with Military Honors provided by American Legion Post #167 will be in Mamrelund Cemetery, rural Pennock. Visitation will be from 5-7:00 pm, Thursday at Harvey Anderson Funeral Home in Willmar and continue one hour prior to the service at the church on Friday. Donald LuVerne Magnuson was born July 26, 1931, in St. John’s Township, near Pennock, Minnesota, the son of Walter and Esther (Wall) Magnuson. He grew up in the Pennock community and graduated from Willmar High School in 1950. He was active in football and basketball and became a referee in both sports. Don served in the U.S. Army from March 1954 to March 1956, serving overseas in Austria and Germany after a year of statewide duty in the Military Police Unit. After returning home from his army service, he worked for Central Sheet Metal for 20 years. In 1978, he went into the heating, air conditioning, and manufacturing business and began Magnuson Sheet Metal. He eventually formed a partnership with Craig Aurand. He also farmed with his son and grandson. One of his greatest joys was combining corn. On February 12, 1954, he was united in marriage to JoAnn Holmgren in Willmar. They were blessed with three children: Jerry, Jolene and Jan. He was a devoted husband, father, grandfather, and great-grandfather. He loved being with his family and friends and enjoyed going on vacations with them. One highlight was a trip to Salzburg, Austria where he was stationed during his army days and touring Germany and Switzerland. He was an avid hunter and went to Montana hunting deer and antelope with his family and friends for 50 years. Don was a member of the Willmar Assembly of God church where he was an usher for 30 years, worked in Royal Rangers, organized with other men the Wild Game Feed and participated in that event for 27 years, and was on the building committee during the construction of two churches. Don is survived by his loving wife of 65 years, JoAnn; their children: Jerry (Nancy) Magnuson of Pennock, Jolene (Scott) Swanson of Willmar, and Jan (Mike) Johnson of Alexandria; ten grandchildren: Jason (Kari), Krista (Dan), Katie (Brian), Jennie, Kelsey (Jordan), Alida, Torin, Luke (Christa), Lauren, and Aaron; and 8 great-grandchildren: Lane, Kendyl, Jase, Bryn, Reagan, Brecken, Heatley and Elin. Also surviving are his sister-in-law, Audrey (Ted) Huisinga of Willmar; and other relatives and friends. He was preceded in death by his parents, Walter and Esther Magnuson.